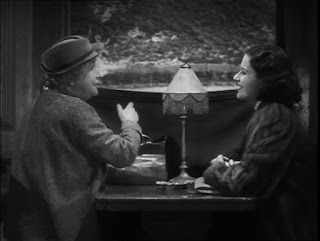 Years ago, we were watching a 1946, black and white movie co-starring a talented young actress. Someone recognized her from one other movie, and commented that she seemed to have just disappeared after that. It's not an unusual comment, but that time, the word "disappeared" bothered me and set me thinking about how our superficial culture values visibility. Disappeared? The assumption is that since audiences never saw her on the silver screen again, it was clear that her career as an actress had fizzled. She had failed in Hollywood. She was a nobody. Poor girl. But, as a new wife and mother myself, that attitude of our culture wasn’t good enough for me. I suggested that the actress hadn’t failed; she had likely achieved what was, for her, a better and sought after position, for which she happily traded the fun of her acting stint and hope of future riches. She probably got married and raised a family. She had weighed her options and chose the better portion – for her. While it’s true that some actresses of that time were able to do both, the 1940s and ‘50s were a time when being what is now called a “stay-at-home mother” was seen as the norm. Hollywood often made women choose between stardom and motherhood through violent end to pregnancy. * Hollywood has never been kind to women. Our society tells us we must be seen succeeding to matter. This supposed scandal of invisibility reveals not only a grossly self-centered sense of importance in the viewer – if I can’t see you, you don’t really matter – but also the lie that our own most important audience is that of our peers. Naturally we come across this in the celebrity culture; being noticed is what celebrity is all about. But celebrity based on ethereal appearance, momentary popularity, outrageous behavior is not what really gives us importance – or dignity. It is a lie to believe that we are important only to the extent that others admire us for how we appear or what we do. Our human dignity does reside in an image, but it lies in the fact that we are made in the image of God. And He is our most important audience. This great source of dignity surpasses our visibility to our peers. The dignity of each human person is to be respected, whether that person is a movie star, a stay at home mother, a billionaire, a person living on the street, a sports hero, a prison inmate, a monk, or the tiniest child hidden in a womb. You may have seen articles about women who gave up everything to be a nun. 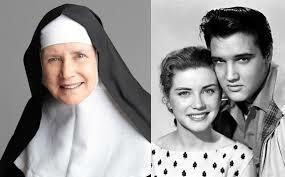 Dolores Hart, for instance, acted opposite Elvis Presley and was his first screen kiss, but followed God's call to a Benedictine Abbey. We love to hear stories about what they gave up. Why is it always that they “gave up everything” or “threw it all away”? It’s really more like they quit a very public, superficial job to receive everything. They sold all they had to buy a pearl of great price. And a person following the will of God in his or her life, aspires to a far, far greater goal than the person who merely “follows her dream!” Hard work toward a goal is admirable of course, but the prize of mere glory and celebrity rather lacks luster compared with the crown of glory given by God to one who has lived a life of self-sacrificial love for the good of others. Sometimes, when the latter is the goal, the former accompanies it. Just think of Mother Theresa who became famous and beloved even though she did not seek celebrity. When I lived in a university community amongst professors and their families, I would often see mothers of young children and big families, whose previous accomplishments were unseen in their current context. Unless you knew them, you wouldn't know that the mom patiently pacing the sidewalk with her newest walking baby was a pharmacist. That lady piling her crew into the minivan had been a smart, D.C. attorney. The woman pushing two cherubs on the swings had starred in an opera in Italy. Now, they were anonymous moms. Even though the role of mother is highly sought after by many women and dreamt of by many doll-toting little girls, the actual job does entail a good deal of tedium and hiddenness. Often, the world doesn’t even want to see this job happening. At least, that is the experience of many mothers when they take a gaggle of children to the grocery store, cope with a screaming toddler at Mass, or nurse a baby in public. 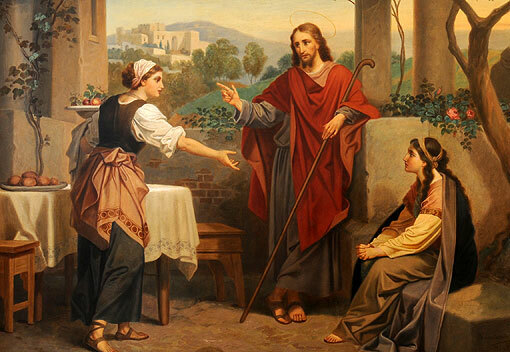 Mothers would do well to meditate on the greatest event in time and space, the Annunciation, for inspiration and aspiration. While the greatest event ever, it was among the most hidden. On the human scene, Mary was something of a nobody. But, in reality, she was The Woman, anticipated from the beginning of history. 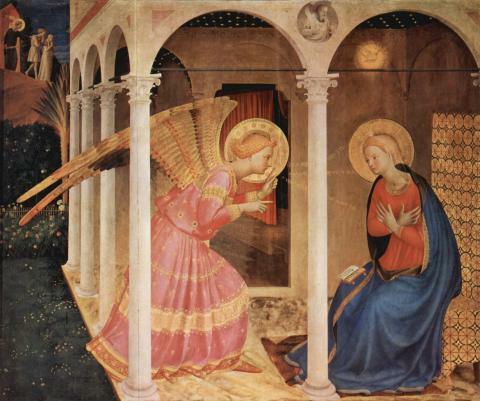 The Angel Gabriel appeared to her with the announcement that changed human destiny – and awaited her assent. The Incarnation of God occurred in a hidden womb in a private room without an audience, without a press release, without even a Selfie taken of the event! Mary told no one. She sought no celebrity. God handled the publicity. The unassuming job you mothers are doing in the isolation of your home, with little adulation, apart from flowers and burnt breakfast every Mother’s Day, is important. The little secrets you are protecting and caring for may be what saves the day. So, it's no wonder your apparent worth is being attacked! You certainly have a good model in the Blessed Virgin Mary. If God has called you to motherhood, you are not giving up everything worthwhile, you are choosing the better portion and it will not be taken away from you. A great read, and an important reminder of the important things. Thanks! I'm glad you enjoyed it! Thank you for your kind comment! I could not help remembering the song sung by Kitty Kallen, "Little Things Mean A Lot", and, of course, the Little Flower. Professer Robert George down in Princeton had a short piece in his blog this morning about true love, and it being volitional not emotional. And that reminds me of another song, Love Hurts, the old one not the new one. And that reminds me of the Crucifixion.